The Personal Cloud: Truth or Dare? Analysts love to coin new expressions. The one I’m most proud of is “Business Intelligence,” which I thought was a lot sexier than “data mining” and “data warehousing,” two earlier expressions which meant essentially the same thing. IBM and a couple of other big companies jumped on the Business Intelligence bandwagon and made it an IT proverb. I shoulda copyrighted or trademarked it, or started a domain business-intelligence .com. Mighta made a few bucks. Water under the dam. In any event, I read the press release. I thought it made sense -sort of. Do you agree with the following quote? The 46-word opening sentence aside (my composition professor would have slammed that writer), I agree that users will potentially be more productive using the cloud, but I’m having a tough time with the prediction that enterprises will have to rethink how they deliver services to users. In my experience, enterprises seldom rethink anything. Rather, they change as little as possible so as not to freak out those users and make more work for themselves. Don’t get me wrong. I think the cloud is terrific. As I mentioned in an earlier post, the timeshare business of the late 60s – early 90s essentially offered cloud computing, but, in those days, networks were slow and storage capacity limited. Today’s broadband networks and virtually unlimited random access storage enable a user to do almost anything online instead of the desktop. 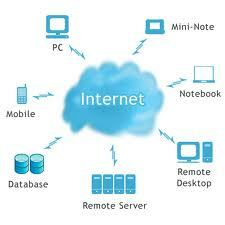 The only real barrier to cloud computing is security, an issue that I believe will never get resolved. If you are skeptical about the cloud, I’d like you to test out an app called Dropbox, a web-based file hosting service. You can get a free single-user account or an account that can be shared by several users. The learning curve is practically non-existent. It’s a great example of cloud storage. Of course, these personal apps have little to do with enterprise applications, but will certainly give you a taste of the possible.